History: Dale raced his entire 83-race career at Southland. He raced his way up the grading ladder and ran 5 stakes races in 2011 and 2012. He injured himself in August, 2012 and was returned to the farm. They never figured out what his injury was; and although the owner planned to send him back to the track, he seemed to lose interest and was no longer competitive. 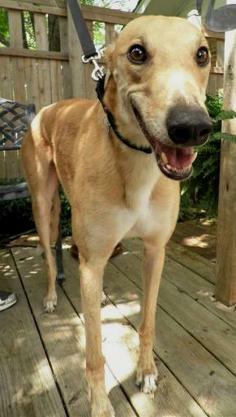 Dale is a big red boy with a big outgoing personality. He is very friendly and should become a Velcro dog in no time. 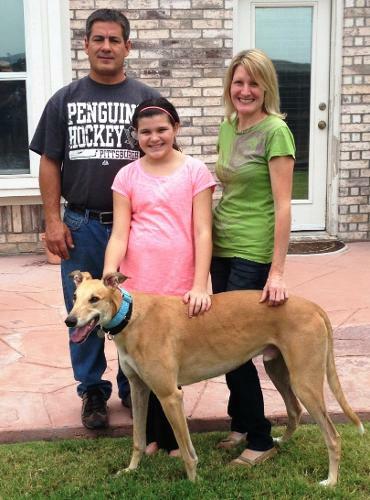 Dale with his new family - Congrats to all! 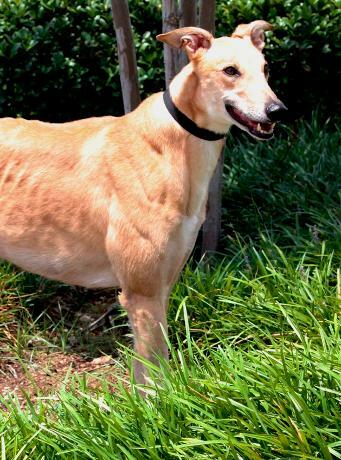 September 28, 2013 update: Dale adopted to his lifetime home. Congratulations to all. September 10, 2013 update: I think the word that best describes Dale, other than sweet, is enthusiastic. He seems so happy just to be with me and my two Greyhounds. He immediately joined right in with any and every activity that occurs and doesn't have a problem being the new guy. He wants to meet everybody that visits the house and wants to know what is happening at all times. He does not often get into things but he is still learning about home living. If I go into another room, Dale goes too. If there is a noise, he wants to know what it is. Dale loves to be around me and sleeps on a dog bed at the foot of my bed. He is not shy and sometimes I need to tell him a couple of times to go lay down and leave me alone when I’m being rude by eating in front of him and my other two Greyhounds, but he always obeys. Dale has never once tried to get on the couch or beds while I was around and I don’t think Dale would be shy about trying right in front of me if he had a mind to. I've never found evidence that he was on furniture while I was out, even though my other two dogs are allowed on furniture. He has really adjusted well to riding in the car for an hour or more at a time. I am still working on getting him to load up easily. He doesn't fight it, but he doesn't embrace it either. Dale is so good natured, and he makes me smile every day. Dale wants to eat, sleep, and hang around the house. My kind of dog!. 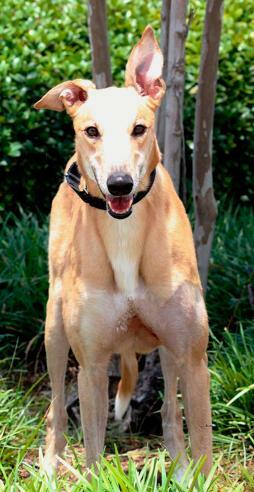 June 22, 2013 update: Dale came back to TAGS today to find his lifetime home. 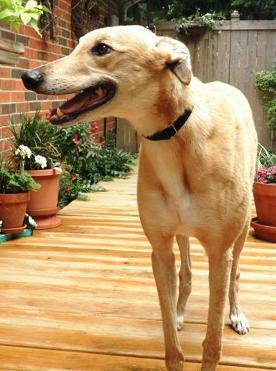 His adopters have decided that they are a one dog family. 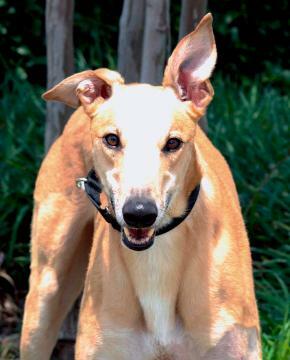 June 15, 2013 update: Dale went to his forever home today and is now Lovie's brother. Congrats to all! May 28, 2013 update: Dale had a big day yesterday – traveling, bathing, sleeping, eating and meeting new housemates. He gets along with all the hounds in the house and learned “follow your mama” immediately. There’s another 4 feet behind me wherever I go. He had no problem finding a bed in the bedroom or settling down for a good night’s sleep. His only issue was itching, which woke him up occasionally. Today he has taken some Benadryl and that has helped. Hopefully his skin will stop itching now that the fleas are gone. He had another big day today of new things – spending several hours in a crate, another car ride (this time to the vet for blood draw) and to a friend’s house for a walk with a female greyhound that is his matching bookend. At the vet he saw two little dogs and was very intent on getting closer. On the walk he saw birds, squirrels and rabbits – it’s a good thing he wears a Martingale collar with a good strong leash, although I must admit he walked exceptionally well on a leash (except when he saw critters). We’ll give him some time to settle in and after his neuter we’ll try him with small animals. He even tried to chase a piece of white paper blowing through the parking lot yesterday when we picked him up. With people he is very friendly, loves to have his head petted and will let you sit on his bed with him (he wants you pet him, of course). Hopefully his transition to home life will be an easy one. 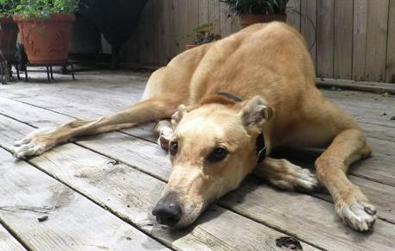 May 27, 2013 update: Dale came to TAGS to find his lifetime home and to settle into retirement.